Fair Finance Japan: Help Your Bank Become More Ethical! Some banks and pension funds have rules about what kind of companies they invest in. For example, ethical investment means the funds do not support companies involved in weapons manufacturing or environmental destruction. Human rights and labour rights are other issues that many people should urge their banks to support. Since starting in 2009, a Dutch initiative has grown into an international campaign, Fair Finance Guide. Now, Japan also joins this great project, started by A Seed Japan, JACSES and PARC. They have carefully investigated five of Japan’s largest banks. Their new website (http://fairfinance.jp)* will help you compare their score on a range of issues. For example, Mizuho Bank scores relatively high on transparency, but low on environmental issues like forestry protection. All five get “Zero” for their investments in armaments, except Mitsui Sumitomo Trust, that scored “One” which is still terrible. Resona scores worse than the others on climate change and food issues (including GMO and pesticides). No bank scored a perfect “Ten” any of the issues, as determined by Fair Finance Japan. There is clearly room for improvement. You can help by clicking on the links on the website. A message will be sent to Fair Finance Japan and then directly to the different banks. In Europe, reports about how banks invest in questionable corporations have led to the emergence of a large number of ethical pension funds, as people increasingly want their life savings to support good practices. I think this is a really good idea! We will hold an informal viewing of the groundbreaking documentary, Cowspiracy, at the CUJ office on March 11, 2015. The video is in English with Japanese subtitles. Start: 15:00. As Andersen approaches leaders in the environmental movement, he increasingly uncovers what appears to be an intentional refusal to discuss the issue of animal agriculture, while industry whistleblowers and watchdogs warn him of the risks to his freedom and even his life if he dares to persist. This shocking yet humorous documentary reveals the absolutely devastating environmental impact large-scale factory farming has on our planet, and offers a path to global sustainability for a growing population. 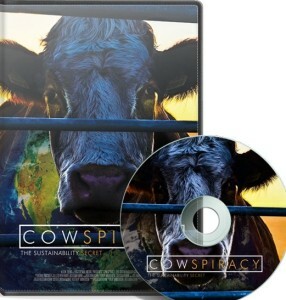 You can order your own copy of the film on the Cowspiracy website!